Display is big business, it accounted for £3.03bn of UK digital ad spend in 2016, but core channels like display, which were previously a stalwart of brands’ media investment, are now increasingly under the microscope. While it’s undoubtedly great for mass brand exposure, display, for example, must offer lower and lower cost per thousand impressions rates to yield the ROI that Marketers are under pressure to achieve. Additionally, programmatic buying of display ads, whilst delivering on volume of impressions, has recently come under fire from advertisers concerned about the damage that the wrong ad environment can do to their brand (particularly in the current political climate, with agencies scrambling to reassure advertisers that their brands will not appear on controversial blacklisted sites including Breitbart). Then there’s the straight up issue of performance. The average Click Through Rate for a display campaign is 0.06%, with email acquisition yielding on average 2-4% for comparison – over 30 times more website clicks for a similar spend. That’s a mathematical no-brainer. I was prompted to write this blog after one of our account management team recently met with the Marketing Director of a large retail brand, who revealed that they’d turned their display channels off entirely, stating that their marketing budget investment criteria comes down to an ROI metric, and “if it wasn’t delivering results, it wasn’t the right channel”. This is just one example, but it illustrates nothing short of a seismic shift in many brands’ thinking over the past few years, when it comes to their media budget. No channel has an automatic seat at the table any more, they all must work harder to justify investment. This is also reflected in more brands adopting a “Zero Based Budgeting” (ZBB) strategy to rationalise their marketing spend, as reported by Marketing Week. ZBB is defined as where marketing spend is not based on previous performance, instead marketers must start from “zero” each year and drive up ROI by looking afresh at what channels and activities will deliver best, based on value metrics. Of course, different brands work to different measurements of marketing success, and for many, straight ROI has to be balanced with the need for volume of impressions and the sheer scale of awareness that display can deliver, or for example, the high level of engagement and conversion that direct mail can deliver. By far the most effective marketing strategies deploy multiple channels with a sophisticated understanding of where their individual strengths lie, and how they can complement each other. For example, retargeting consumers who have seen a display ad, with an email, can increase conversions by 22%. However, for brands looking to measure performance across multiple metrics including; lead tracking, accountability, relevancy, brand safeguarding, level of consumer engagement, volume of reach, brand awareness and click through rate, email is re-emerging as a rock star channel which hands down outperforms other channels on most counts. Not least the fact that consumers actively prefer brands to communicate by email – with 74% consumers stating that email is their top preferred channel to receive brand messages and offers (Merkle), a clear fifty percentage points ahead of any other channel. Furthermore, there’s a buzz now around email which isn’t just down to nostalgia. A recent article in The Drum on “Bringing back the renaissance marketing trends in 2017” noted that advertisers are looking to channels in 2017 which can deliver a return to genuinely putting the consumer’s interests first, like email and direct mail. As well as allowing for greater personalisation and a “safe” environment for brands, these “renaissance” channels are seen as heralding a new era of more human, humbler, and simpler communications, which resonate with consumers once more, and can set brands apart from the constant digital chatter that is the backdrop of all our lives. 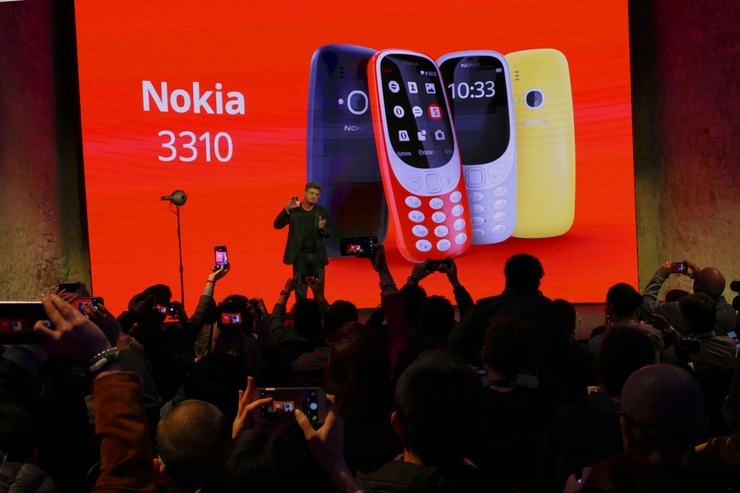 The relaunch of the much-loved Nokia 3310 at Mobile World Congress last week created arguably the biggest moment of the event. People loved these handsets because they did what they were supposed to do, and they did it well. The relaunched version promises an improvement on the 17 year old classic, with a battery life of a month. The email channel has also seen a reboot over the past few years, and stringent data regulation combined with responsible email sending practises becoming standard, have eradicated the legacy SPAM issues that email used to be associated with. With the advent of a consumer’s email address being their most stable online identifier, and the ability for email customer acquisition platforms to match email addresses to cookies and mobile IDs in order to deliver a single customer view in real time (disclaimer: our platform can do this), email has been rebooted, and the customer data and performance that it can unlock, is now more important than ever before to advertisers whose strategies are truly focused on their customers. Ultimately though, marketers must demonstrate how each channel directly contributes to clicks and bottom line sales, in order to continually invest in the channel, and this is where email, where every part of the creative is transparently trackable and accountable, really proves its credentials.